The IRS refused to fire most of its own employees found to be cheating on their taxes — and in some cases even quickly turned around and promoted them within the year, according to an audit released Wednesday. In about 60 percent of cases of “willful violations,” IRS managers found mitigating circumstances and refused to fire the employees, even though the law calls for that penalty. In some of those cases, the managers didn’t even document why they had overridden the penalty, said Treasury Inspector General for Tax Administration J. Russell George...From 2004 to 2013, the IRS identified nearly 130,000 suspected cases of tax violations by its own employees and concluded about 10 percent of those were actual violations. Mr. George said the agency did a good job of spotting those issues. Of those 13,000 cases, 1,580 were deemed to be intentional cheaters, and they were sent to managers for discipline. But in 60 percent of the cases, the managers refused to fire the employees. Among the abuses were employees who repeatedly failed to file their returns on time, those who intentionally inflated their expenses and those who claimed the stimulus homebuyer’s tax credit without buying a home. Of the 1,580 employees deemed to have intentionally cheated on their taxes, 108 of them received no punishment at all. The others were at least admonished, while 25 percent were fired, and 14 percent were allowed to resign or retire instead of being fired. The vast majority of substantiated reports involved “nonwillful” violations. Of those, just 238, or about 1 percent, were deemed serious enough to be fired. Another 1 percent were allowed to retire or resign, 47 percent were admonished, 26 percent were sent to counseling, and 14 percent were closed without any punishment. More than 2,000 employees had multiple red flags during the decade, the inspector general said. Investigators pulled a sample of 15 cases where an employee had repeated intentional violations and found that even there, the majority were allowed to remain on the job. The inspector general took a sampling of 364 cases of intentional cheaters and found that 108 of them were not only not fired, but were given raises or promotions within a year of being found to be cheating. While facing budget cuts, the IRS nevertheless prioritized worker bonuses, union activity and the implementation of President Obama’s health care law over assisting taxpayers during tax season, according to a new report released Wednesday by the House Ways and Means Committee. 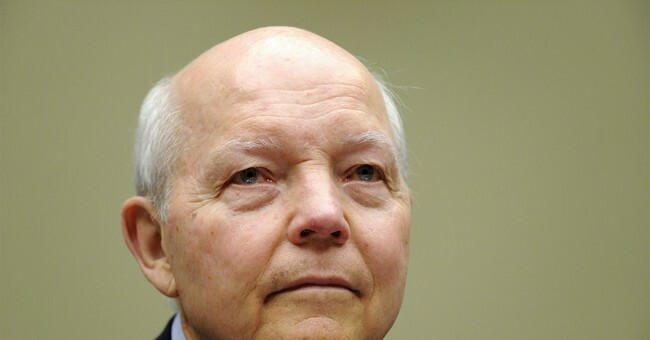 The findings, in a Republican-led report, were released ahead of a subcommittee hearing Wednesday morning with IRS Commissioner John Koskinen. At the hearing, Koskinen stressed that the agency is significantly under-funded, and those cuts have consequences. He said less funding means there will be a decline in service for taxpayers, and pledged that service would improve if they got more money. 'Give us more money, or we'll make sure to tighten our belts in such a way that inflicts harm and inconvenience on taxpayers, while protecting our own financial and political interests.' Public servants. Selfish cynicism is a learned behavior.